THE BRITISH AERIAL TRANSPORT CO.
is showing two machines, one a B.A.T. Bantam with 170 h.p. A.B.C. "Wasp" engine, and the other a diminutive monoplane, called the B.A.T. "Crow," with 30 h.p. A.B.C. 2-cyl. "Gnat" engine. The former machine is well known to our readers, as it was described in FLIGHT recently. It is painted in white, as is also the "Crow," and looks very graceful and pleasing to the eye. The B.A.T. "Crow" is, probably, the smallest man-carrying aeroplane in the world. To those who remember the early days of flying, this machine may, perhaps, be described by saying that it is a Santos Dumont "Demoiselle," designed in the light of modern aeronautical knowledge. 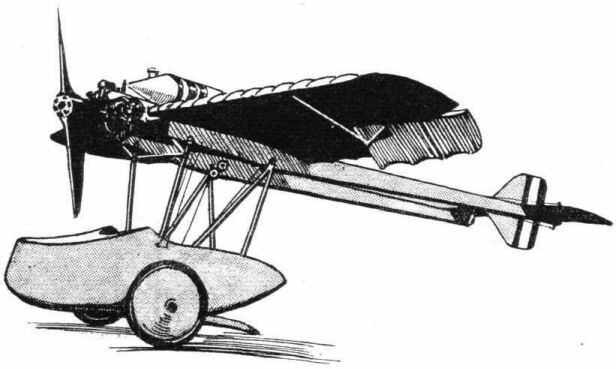 The Demoiselle, it may be remembered, was a short-span monoplane, with the pilot placed in a seat below the wings, immediately behind the propeller. This, in effect, is the arrangement of the B.A.T. "Crow," although naturally the detail design and construction is hugely improved. The A.B.C. Gnat engine is mounted on the leading edge of the wing, and drives a small Ebora tractor screw of about 5 in. diameter. The fuel tank is mounted on top of the plane, and is divided laterally, the oil being contained in the smaller front part, while the rear portion of the tank carries the petrol. As already mentioned, the "Crow" is a monoplane, and it should be added that the wings are of the cantilever type, with no external bracing. The consequence is that the machine can be dismantled or erected in a few minutes by undoing half-a-dozen bolts. It consists, in effect, of two units: The planes, and the tail planes and booms and the car. The wings, being of the cantilever type, are tapered from root to tip, and are fitted with ailerons for lateral control. Two tail booms, also cantilever beams, of built-up rectangular section carry at their rear end the tail surfaces, and in front are bolted to the wing spars. There is a small symmetrical tail plane and a divided elevator. The vertical fin extends above and below the tail plane, and to it is hinged the rudder,. In its present form it would appear that a twisting stress on the tail might be transmitted to the wings and cause trouble, but we understand that in the next machine of this type the tail boom bracing will probably be somewhat altered to overcome this difficulty. The pilot, as in the case of the Demoiselle, is seated below the wings, but is sheltered to a greater extent than in that machine, being installed in a small nacelle not unlike a sidecar for a motor cycle. The controls are of the stick type. The nacelle is carried on six steel tubes of circular section, coming down from the wings. Passing through the bottom of the nacelle is a flat laminated spring of wood, which carries at its ends short stub axles for the wheels. To the casual observer this arrangement may appear somewhat inadequate, but it should be remembered that the machine is extremely light (the weight empty is about 220 lb. ), and that, therefore, the under-carriage need not be particularly strong, especially as the pilot is seated almost on the ground, and, hence, can judge his landings to a nicety. As she stands, and with a pilot of average weight, the "Crow" weighs, we believe, about 7 lb. per square foot of wing area, and about 10 lb. per horse-power, so that, judging by these figures, the performance should be very good. The machine has not yet been flown, but in view of the fact that the petrol tank is mounted on top of the centre section, i.e., at a point where the lift is probably greatest, the wing loading may prove somewhat on the heavy side, and it might be found advisable to increase the wing area of the next machine slightly. On account of its diminutive size, the "Crow" is one of the attractions of the show, and we understand that an enormous number of enquiries regarding price has been received. The first of these came from a Dutch carpenter working at the exhibition, who quite seriously asked the price as he wanted one of these machines. For use in Holland it is a question whether it would not be possible to design the little nacelle as a boat or float, thus enabling the machine to start from and alight on the rivers and canals with which Holland is so plentifully supplied. The flying tests of the "Crow" will be awaited with interest. On the aerodrome are two B.A.T. machines, a "Bantam" and the second machine of the F.K. 26 series. The B.A.T. "Crow": This little machine, fitted with a 2-cyl. A.B.C. "Gnat" engine, attracts great attention at the E.L.T.A. Show. Briefly speaking, it is a "Demoiselle" brought up to date.